Happy New Year! But first, I have to post the final Hooked on Golf Blog Product of the Year Award. I caught a bug the last couple days of 2018 and it kept me from posting the final post of 2018, in 2018. Let’s get right to the Product of the Year award in the Golf Apparel category. 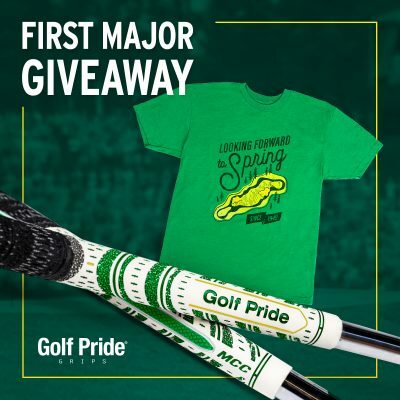 Golf apparel has really benefited from advancements in technology in the last 5-10 years. There are dozens of candidates for this award, from all the products which came in for review in 2017. Once again, the winner was clear; head and shoulders above the rest. This jacket is a windproof, water repellant jacket which is terrific for all sorts of conditions from rain to wind, to that slight chill where long sleeves is too much. This jacket shines in windy conditions, and even has a draw string at the waist to help keep the wind out. This jacket features such high performance, comfort, and style. It is tremendous. 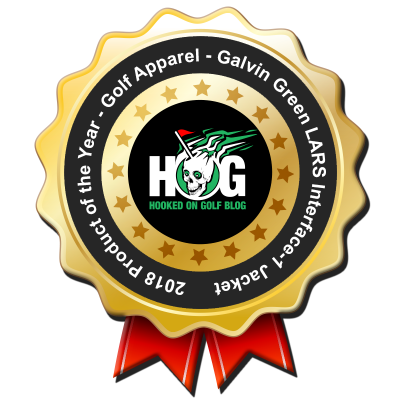 Hats off to Galvin Green for doing what no other company has managed to do yet, win a HOG Product of the Year award two consecutive years. Check back at the end of 2019 and let’s see if they can make it three. I must admit this review of the Galvin Green LARS Interface-1 jacket took me awhile. You see, in northern Utah we have two seasons: unbearable heat and winter. We are a desert technically, so we don’t get much rain. So testing rain jackets is more of a challenge. And keep in mind, I do on-course testing, not just fly by one-wear reviews of golf apparel. I’ve been thrilled to have the LARS in the bag, in the unlikely event that some rain hits. 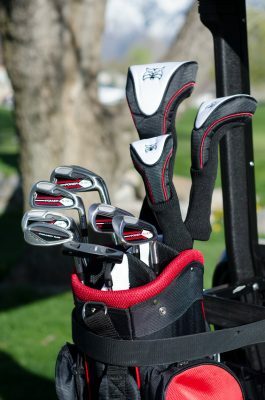 But due to some traveling to Florida, Bandon Dunes, and Mexico, I’ve had some great rounds logged with the LARS. 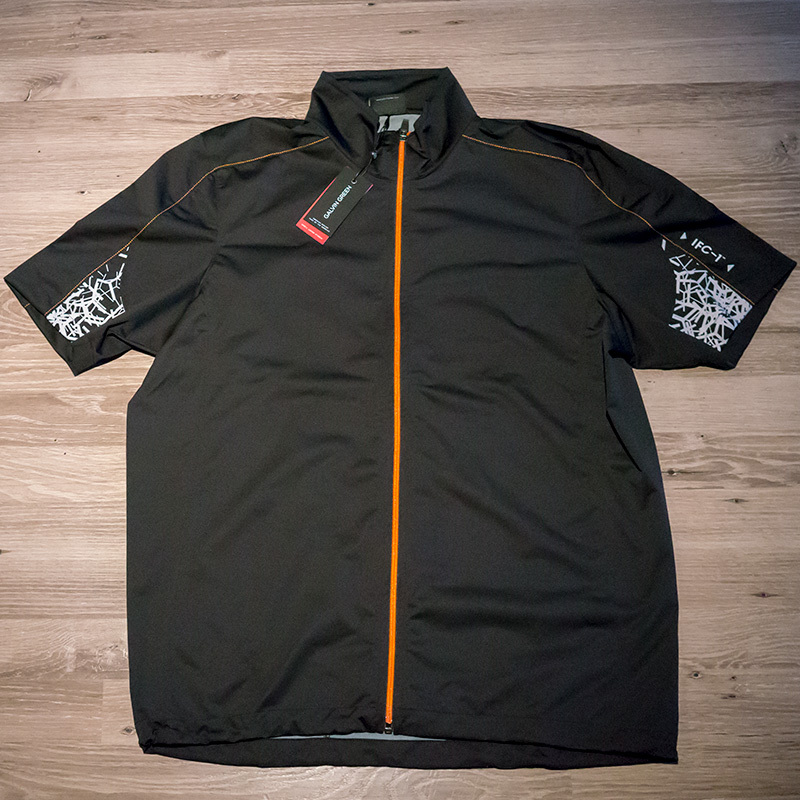 This LARS jacket by Galvin Green is a short sleeve windproof, water repellant jacket. LARS is versatile jacket for varying conditions when sleeves are not wanted or needed. The outer layer is a tightly knitted Polyester combined with a polyurethane membrane which is soft and smooth on the inside. The waist has a draw string which is great for tightening down the hatches and keeping the wind out. I also like to tighten it to keep the garment from interfering with my putting stroke or golf swing. 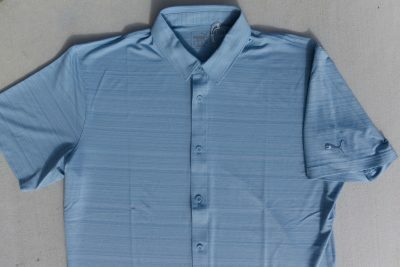 LARS comes in three super colors, back (pictured), dark blue, and green. LARS comes in sizes small to triple-XL. On one of my recent rounds in Florida a light rain started to fall. The problem is that the temps were about 85 degrees. The last thing I want to do is put on a long sleeve jacket and cook myself to death. The LARS kept my core dry, but allowed me to stay cool, at least physically. I sported the LARS a ton on my trip to Bandon Dunes this past summer. At Bandon the temperatures were in the 60’s, but with huge amounts of wind. Thanks to the LARS jacket I weathered the high winds well, pun intended. My enjoyment of that tremendous golf destination was aided by having the right apparel for the conditions. I’ll wear the LARS around town too, when I need to just cut the edge off of some wind or slight chilly conditions. One note about LARS. The style has a big of an edge to it, with the white graphics under the sleeves and on the back shoulder area. I like that quite a bit. It goes right along with my rock & roll attitude. But LARS is certainly not obnoxious or over the top. It’s super classy and sharp looking. 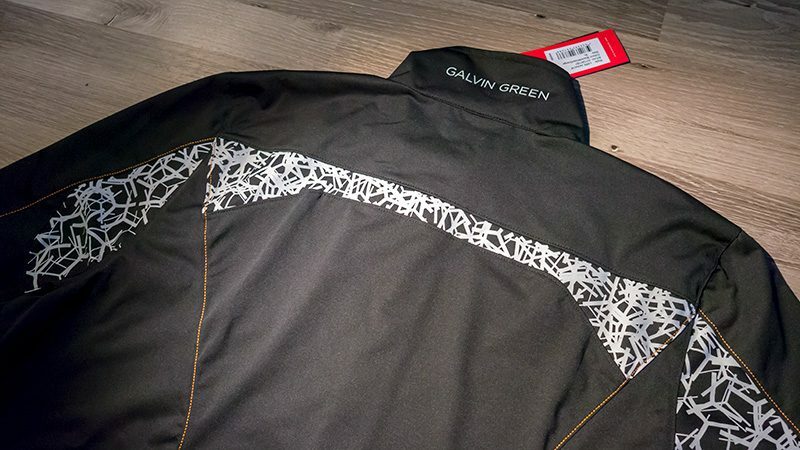 Galvin Green’s LARS Interface-1 jacket lives up to what I expect from Galvin Green. Over the years I’ve reviewed many GG products, and they’re all of the highest quality and design. The price for their products is not cheap. In fact, it’s almost in the “if you have to ask how much it is, it’s probably too much” department. That said, the LARS is worth every penny of its $329USD retail. Spring can’t come fast enough. 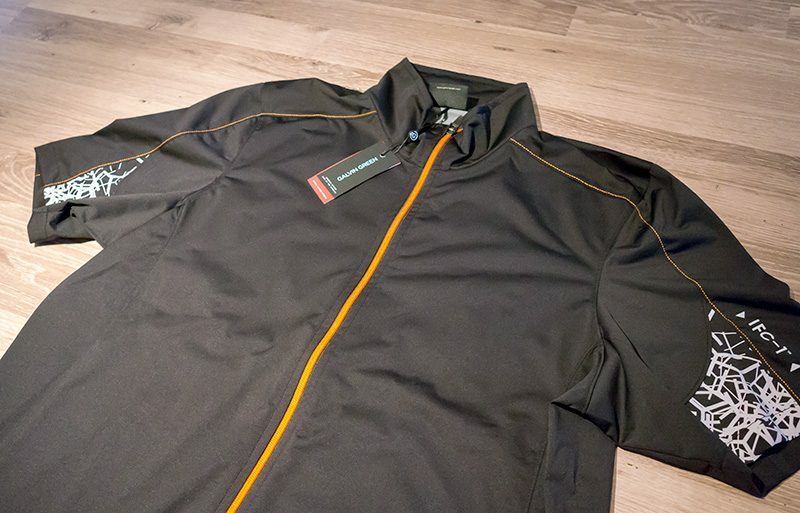 I’m anxious to try out the new LARS Jacket from Galvin Green, part of their “Interface” product line. Behold. This will be a perfect option for those times when long sleeves aren’t enough, but some protection from a slight chill, wind, or rain is needed. Given the ultra-high quality I’ve come to expect from Galvin Green I have 100% confidence this will be a gamer. Check out the back. It’s got a bit of an edge to it which I really dig. Stay tuned for the full HOG review in a month or two. The snow is melting, but not fast enough! The Insula Dash pullover is a 1/4 zip golf outerwear piece that exudes style and provides great comfort and performance. “Body mapping” was used to assist in the design of this tremendous looking and high performance pullover, helping to determine areas which need optimization for breathability. Extra padding on the shoulders and arms not only looks cool, but provides extra insulation and warming in crucial areas. Innovation, style, and performance have really set Galvin Green apart from other golf apparel companies. 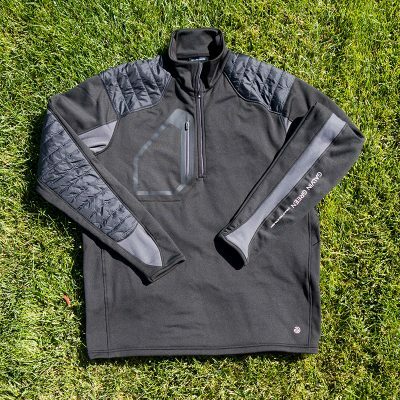 For more details on this fantastic apparel piece, check out the HOG Galvin Green Dash Insula Pullover review. Hats off to Galvin Green for claiming the 2017 HOG Apparel Product of the Year. I look forward to seeing what Galvin Green comes up with in 2018. It’s getting cold here and I’m fully prepared and stylish in my new Galvin Green Dash Insula Pullover jacket. Galvin Green makes some of the most amazing golf apparel and outerwear on the planet. It’s really several steps above just about anything else out there. The 1/4 zip Dash Insula pullover features a warming layer which helps keep the player (me) warm, which keeps me loose and especially helps prevent muscle strains and injury. The primary insulation/warming of the Dash is provided by Galvin Green’s INSULA material. The shoulders and elbows have a thicker padded area which provides more warming effect on crucial, exposed areas. “Body-mapping” technology was used to determine the areas to pad, and what areas need more optimized breathability to prevent moisture buildup. The dash is easy to wash and care for, made from 90% Polyester, 10% Elastane. 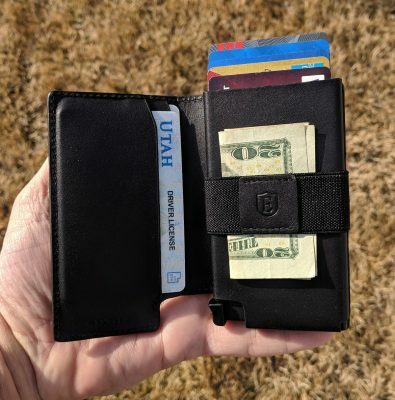 One very interesting design feature and technology is the front pocket. It’s good for a cell phone, or smaller, thin item. The pocket is actually “welded” to the body of the garment. The comfort and fit of the Dash Insula Pullover is perfect. Not too baggy and not too tight. Somehow the shaping of the garment can give me a more chiseled look, which I’m happy about. During the golf swing there is no binding, pulling or stiff areas. The pullover flows with my swing, which isn’t easy to do. It has to bend in multiple bizarre and odd directions! The performance of the jacket is tremendous. The warmth it provides helps keep me loose and with a bad back which stiffens easily in the cold, that’s a very important quality. On days where the weather is a wee bit worse or more wet, I’ll use the Dash as a middle layer with another outer layer on top of it. Galvin Green products are of the highest quality and most innovative design in the golf apparel world. Their performance is unsurpassed. The Dash Insula Pullover enhances the already tremendous Galvin Green lineup as a go-to outerwear piece, or as a middle layer. If used as a middle layer, it matches up perfectly with the Galvin Green Bart Windstopper Jacket as the outer layer. Pricing for the Dash Insula is commensurate with it’s quality and performance, about $250 on the street.